ProParagraph: Wire is a set of 30 self-animating informative title presets with fully customizable design elements. ProParagraph: Wire features wireframe designs and elegant title animations with 3D controls. ProParagraph: Wire is designed to help with the production process, making editing titles simple and fun for all FCPX users. Use ProParagraph: Wire to get footage wired for any Final Cut Pro X productions. ProParagraph: Wire delivers a wireframe look for all informative title animation productions. Each preset establishes a mesmerizing style in addition to simple designs that can be combined with any background media. Furthermore, FCPX users can alter the text and design element colors in order to quickly create informative titles for any project. Choose from a variety of framing-styled animation preset designs that expedite the editing process. 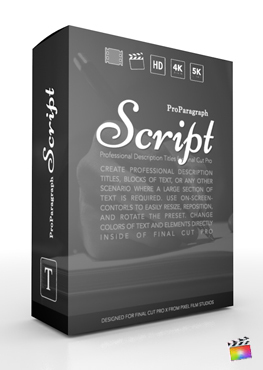 Each ProParagraph: Wire preset includes both an intro and outro animation, as well as the capability to lengthen the timing of the preset itself. Furthermore, entrapping designs with flowing animations will bring an enjoyable mood to any video production. Therefore, users can take advantage of ProParagraph’s intuitive style to bring an informative structure across all media applications. ProParagraph: Wire’s simple user-interface options offer an effective method for users to customize each preset design with on-screen controls and slider options. On-screen controls allow editors to change the positioning, rotation, as well as the scale of each preset. Consequently, ProParagraph makes it simple to create a variety of uniquely different designs. Customize colors, length, width, opacity, and sizes with user-friendly slider controls in order to establish new and personalized designs. In addition, 3D rotation controls have been provided to create a more immersed design ability. ProParagraph: Wire has been created exclusively for Final Cut Pro X users. To use, simply drag and drop the desired title preset onto the timeline above any source media and customize accordingly. Each preset has been hand-crafted in order to be used with any type of desired media, such as videos or images. ProParagraph: Wire is entirely editable within and exclusive to Final Cut Pro X. 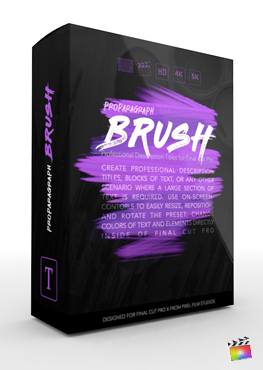 In conclusion , Pixel Film Studios’ ProParagraph is perfect for all multi-line text productions. I installed ADD PLUGIN NAME HERE and see a red screen similar to this. Where do I find ADD PLUGIN NAME HERE? Once the installation is complete, you can find ADD PLUGIN NAME HERE in the FCPX Titles library. Where is the tutorial for ADD PLUGIN NAME HERE?